USS George Washington–the lead boat of US Navy's first class of Fleet Ballistic Missile submarines (SSBN). George Washington was the first operational nuclear-powered multi-missile strategic deterrence asset fielded by any navy. A ballistic missile submarine is a submarine capable of deploying submarine-launched ballistic missiles (SLBMs) with nuclear warheads. 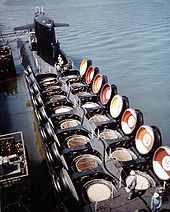 The United States Navy's hull classification symbols for ballistic missile submarines are SSB and SSBN – the SS denotes submarine (or submersible ship), the B denotes ballistic missile, and the N denotes that the submarine is nuclear powered. These submarines became a major weapon system in the Cold War because of their nuclear deterrence capability. They can fire missiles thousands of kilometers from their targets, and acoustic quieting makes them difficult to detect (see acoustic signature), thus making them a survivable deterrent in the event of a first strike and a key element of the mutual assured destruction policy of nuclear deterrence. Their deployment has been dominated by the United States and the Soviet Union / Russia, with smaller numbers in service with France, the United Kingdom, China, and India. The first sea-based missile deterrent forces were a small number of conventionally powered cruise missile submarines (SSG) and surface ships fielded by the United States and the Soviet Union in the 1950s, deploying the Regulus I missile and the Soviet P-5 Pyatyorka (SS-N-3 Shaddock), both land attack cruise missiles that could be launched from surfaced submarines. Although these forces served until 1964 and (on the Soviet side) were augmented by the nuclear-powered Project 659 (Echo I class) SSGNs, they were rapidly eclipsed by SLBMs carried by nuclear-powered ballistic missile submarines (SSBNs) beginning in 1960. Imperial Japanese Navy I-400-class submarines are considered the strategic predecessors to today’s ballistic submarines, especially to the Regulus missile program begun about a decade after World War II. The first nation to field ballistic missile submarines (SSB) was the Soviet Union, whose first experimental SSB was a converted Project 611 (Zulu IV class) diesel-powered submarine equipped with a single ballistic missile launch tube in its sail. This submarine launched the world's first SLBM, an R-11FM (SS-N-1 Scud-A, naval modification of SS-1 Scud) on 16 September 1955. Five additional Project V611 and AV611 (Zulu V class) submarines became the world's first operational SSBs with two R-11FM missiles each, entering service in 1956–57. They were followed by a series of 23 specifically designed Project 629 (Golf class) SSBs completed 1958–1962, with three vertical launch tubes incorporated in the sail/fin of each submarine. The initial R-13 (SS-N-4) ballistic missiles could only be launched with the submarine on the surface and the missile raised to the top of the launch tube, but were followed by R-21 (SS-N-5) missiles beginning in 1963, which were launched with the submarine submerged. The world's first operational nuclear-powered ballistic missile submarine (SSBN) was USS George Washington with 16 Polaris A-1 missiles, which entered service in December 1959 and conducted the first SSBN deterrent patrol November 1960 – January 1961. The Polaris missile and the first US SSBNs were developed by a Special Project office under Rear Admiral W. F. "Red" Raborn, appointed by Chief of Naval Operations Admiral Arleigh Burke. George Washington was redesigned and rebuilt early in construction from a Skipjack-class fast attack submarine, USS Scorpion, with a 130 ft (40 m) missile compartment welded into the middle. Nuclear power was a crucial advance, allowing a ballistic missile submarine to remain undetected at sea by remaining submerged or occasionally at periscope depth (50 to 55 ft (15 to 17 m)) for an entire patrol. A significant difference between US and Soviet SLBMs was the fuel type; all US SLBMs have been solid fueled while all Soviet and Russian SLBMs were liquid fueled except for the Russian RSM-56 Bulava, which entered service in 2014. With more missiles on one US SSBN than on five Golf-class boats, the Soviets rapidly fell behind in sea-based deterrent capability. The Soviets were only a year behind the US with their first SSBN, the ill-fated K-19 of Project 658 (Hotel class), commissioned in November 1960. However, this class carried the same three-missile armament as the Golfs. The first Soviet SSBN with 16 missiles was the Project 667A (Yankee class), the first of which entered service in 1967, by which time the US had commissioned 41 SSBNs, nicknamed the "41 for Freedom". The short range of the early SLBMs dictated basing and deployment locations. By the late 1960s the Polaris A-3 was deployed on all US SSBNs with a range of 4,600 kilometres (2,500 nmi), a great improvement on the 1,900-kilometre (1,000 nmi) range of Polaris A-1. The A-3 also had three warheads that landed in a pattern around a single target. The Yankee class was initially equipped with the R-27 Zyb missile (SS-N-6) with a range of 2,400 kilometres (1,300 nmi). The US was much more fortunate in its basing arrangements than the Soviets. Thanks to NATO and the US possession of Guam, US SSBNs were permanently forward deployed at Advanced Refit Sites in Holy Loch, Scotland; Rota, Spain; and Guam by the middle 1960s, resulting in short transit times to patrol areas near the Soviet Union. With two rotating crews per SSBN, about one-third of the total US force could be in a patrol area at any time. The Soviet bases, in the Murmansk area for the Atlantic and the Petropavlovsk-Kamchatsky area for the Pacific, required their SSBNs to make a long transit (through NATO-monitored waters in the Atlantic) to their mid-ocean patrol areas to hold the continental United States (CONUS) at risk. This resulted in only a small percentage of the Soviet force occupying patrol areas at any time, and was a great motivation for longer-range Soviet SLBMs, which would allow them to patrol close to their bases, in areas sometimes referred to as "deep bastions". These missiles were the R-29 Vysota series (SS-N-8, SS-N-18, SS-N-23), equipped on Projects 667B, 667BD, 667BDR, and 667BDRM (Delta I through Delta IV classes). The SS-N-8, with a range of 7,700 kilometres (4,200 nmi), entered service on the first Delta-I boat in 1972, before the Yankee class was even completed. A total of 43 Delta-class boats of all types entered service 1972–1990, with the SS-N-18 on the Delta III class and the R-29RM Shtil (SS-N-23) on the Delta IV class. The new missiles had increased range and eventually Multiple Independently-targeted Re-entry Vehicles (MIRV), multiple warheads that could each hit a different target. The Delta I class had 12 missiles each; the others have 16 missiles each. All Deltas have a tall superstructure (aka casing) to accommodate their large liquid-fueled missiles. Although the US did not commission any new SSBNs from 1967 through 1981, they did introduce two new SLBMs. Thirty-one of the 41 original US SSBNs were built with larger diameter launch tubes with future missiles in mind. In the early 1970s the Poseidon (C-3) missile entered service, and those 31 SSBNs were backfitted with it. Poseidon offered a massive MIRV capability of up to 14 warheads per missile. Like the Soviets, the US also desired a longer-range missile that would allow SSBNs to be based in CONUS. In the late 1970s the Trident I (C-4) missile was backfitted to 12 of the Poseidon-equipped submarines. The SSBN facilities of the base at Rota, Spain were disestablished and the Naval Submarine Base King's Bay in Georgia was built for the Trident I-equipped force. USS Alabama, an Ohio-class (aka Trident) submarine. Both the United States and the Soviet Union commissioned larger SSBNs designed for new missiles in 1981. The American large SSBN was the Ohio class, also called the "Trident submarine", with the largest SSBN armament ever of 24 missiles, initially Trident I but built with much larger tubes for the Trident II (D-5) missile, which entered service in 1990. The entire class was converted to use Trident II by the early 2000s. When the USS Ohio commenced sea trials in 1980, two US Benjamin Franklin-class SSBNs had their missiles removed to comply with SALT treaty requirements; the remaining eight were converted to attack submarines (SSN) by the end of 1982. These were all in the Pacific, and the Guam SSBN base was disestablished; the first several Ohio-class boats used new Trident facilities at Naval Submarine Base Bangor, Washington. Eighteen Ohio-class boats were commissioned by 1997, four of which were converted as cruise missile submarines (SSGN) in the 2000s to comply with START I treaty requirements. A Project 941 (Typhoon-class) SSBN. The Soviet large SSBN was the Project 941 Akula, more famously known as the Typhoon class (and not to be confused with the Project 971 Shchuka attack submarine, called "Akula" by NATO). The Typhoons were the largest submarines ever built at 48,000 tons submerged. They were armed with 20 of the new R-39 Rif (SS-N-20) missiles. Six Typhoons were commissioned 1981–1989. New SSBN construction terminated for over 10 years in Russia and slowed in the US with the collapse of the Soviet Union and the end of the Cold War in 1991. The US rapidly decommissioned its remaining 31 older SSBNs, with a few converted to other roles, and the base at Holy Loch was disestablished. 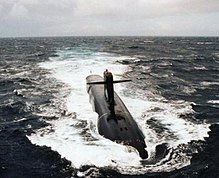 Most of the former Soviet SSBN force was gradually scrapped under the provisions of the Nunn–Lugar Cooperative Threat Reduction agreement through 2012. By that time the Russian SSBN force stood at six Delta IVs, three Delta IIIs, and a lone Typhoon used as a testbed for new missiles (the R-39s unique to the Typhoons were reportedly scrapped in 2012). Upgraded missiles such as the R-29RMU Sineva (SS-N-23 Sineva) were developed for the Deltas. In 2013 the Russians commissioned the first Borei-class submarine, also called the Dolgorukiy class after the lead vessel. By 2015 two others had entered service. This class is intended to replace the aging Deltas, and carries 16 solid-fuel RSM-56 Bulava missiles, with a reported range of 10,000 kilometres (5,400 nmi) and six MIRV warheads. The US is designing the Columbia-class submarine to replace the Ohio-class; and expects to begin construction in 2021. Arihant-class submarines are nuclear powered SSBNs built under the Advanced Technology Vessel (ATV) project by India. They will be the first nuclear submarines designed and built by India. Ballistic missile submarines differ in purpose from attack submarines and cruise missile submarines; while attack submarines specialize in combat with other vessels (including enemy submarines and merchant shipping), and cruise missile submarines are designed to attack large warships and tactical targets on land, the primary mission of the ballistic missile is nuclear deterrence. They serve as the third leg of the nuclear triad in countries which also operate nuclear-armed land based missiles and aircraft. Accordingly, the mission profile of a ballistic missile submarine concentrates on remaining undetected, rather than aggressively pursuing other vessels. Ballistic missile submarines are designed for stealth, to avoid detection at all costs. Nuclear power, allowing almost the entire patrol to be conducted submerged, is of great importance to this. They also use many sound-reducing design features, such as anechoic tiles on their hull surfaces, carefully designed propulsion systems, and machinery mounted on vibration-damping mounts. The invisibility and mobility of SSBNs offer a reliable means of deterrence against an attack (by maintaining the threat of a second strike), as well as a potential surprise first strike capability. In most cases, SSBNs generally resemble attack subs of the same generation, with extra length to accommodate SLBMs, such as the Russian R-29 (SS-N-23) or the NATO-fielded and American-manufactured Polaris, Poseidon, and Trident-II missiles. Some early models had to surface to launch their missiles, but modern vessels typically launch while submerged at keel depths of usually less than 50 metres (160 ft). Missiles are launched upwards with an initial velocity sufficient for them to pop above the surface, at which point their rocket motors fire, beginning the characteristic parabolic climb-from-launch of a ballistic missile. Compressed air ejection, later replaced by gas-steam ejection, was developed by Captain Harry Jackson of Rear Admiral Raborn's Special Project Office when a proposed missile elevator proved too complex. Jackson also derived the armament of 16 missiles used in many SSBNs for the George Washington class in 1957, based on a compromise between firepower and hull integrity. SSBN is the US Navy hull classification symbol for a nuclear-powered, ballistic missile-carrying submarine. The SS denotes "Submarine" (alternatively "Ship, Submersible"), the B denotes "ballistic missile," and the N denotes "nuclear powered." The designation SSBN is also used throughout NATO under STANAG 1166. In the US Navy, SSBNs are sometimes called Fleet Ballistic Missile submarines, or FBMs. In US naval slang, ballistic missile submarines are called boomers. In Britain, they are known as bombers. In both cases, SSBN submarines operate on a two-crew concept, with two complete crews – including two captains – called Gold and Blue in the United States, Starboard and Port in the United Kingdom. The French Navy commissioned its first ballistic missile submarines as SNLE, for Sous-marin Nucléaire Lanceur d'Engin (lit. "nuclear-powered device-launching submarines"). The term applies both to ballistic missile submarines in general (for instance "British SNLE" occurs ) and, more technically, as a specific classification of the Redoutable class. The more recent Triomphant class is referred to as SNLE-NG (Nouvelle Génération, "New Generation"). The two crews used to maximise the availability time of the boats are called 'blue' and 'red' crews. The Soviets called this type of ship RPKSN (lit. "Strategic Purpose Underwater Missile Cruiser"). This designation was applied to the Typhoon class. Another designation used was PLARB(«ПЛАРБ» – подводная лодка атомная с баллистическими ракетами, which translates as "Nuclear Submarine with Ballistic Missiles"). This designation was applied to smaller submarines such as the Delta class. After a peak in 1984 (following Able Archer 83), Russian SSBN deterrence patrols have declined to the point where there is less than one patrol per sub each year and at best one sub on patrol at any time. Hence the Russians do not use multiple crews per boat. Type 094 submarine – 5 in service out of 8 planned. Borei class – 3 active. Arihant class 1 commissioned,1 being outfitted and 2 more under construction. Sinpo-class submarine are North Korea's newest submarine class. Prior to 2015, there were only satellite images of these submarines. On May 9, 2015, the first Sinpo-class launched the first KN-11 ballistic missile under the supervision of Kim Jong Un himself. The test was successful. Since then, there have been five test firings of the KN-11, which can be nuclear armed. It is reported that North Korea is building five more Sinpo-class submarines. These five classes are collectively referred to as "41 for Freedom". On 4 February 2009, the British HMS Vanguard and the French Triomphant collided in the Atlantic. Vanguard returned to Faslane in Scotland, under her own power, and Triomphant to Île Longue in Brittany. ^ Gardiner & Chumbley 1995, pp. 352–353, 549, 553–554. ^ "Large submarines – Project 611". Retrieved 26 July 2015. ^ "Ballistic missile submarines – Project 629". Retrieved 26 July 2015. ^ Gardiner & Chumbley 1995, p. 403. ^ "Nuclear-powered ballistic missile submarines – Project 667A". Retrieved 26 July 2015. ^ Friedman 1994, pp. 199–200. ^ Polmar 1981, pp. 131–133. ^ a b Gardiner & Chumbley 1995, pp. 355–357. ^ "Nuclear-powered ballistic missile submarines – Project 667B". Retrieved 26 July 2015. ^ "Nuclear-powered ballistic missile submarines – Project 667BD". Retrieved 26 July 2015. ^ "Nuclear-powered ballistic missile submarines – Project 667BDR". Retrieved 26 July 2015. ^ "Nuclear-powered ballistic missile submarines – Project 667BDRM". Retrieved 26 July 2015. ^ Gardiner & Chumbley 1995, p. 553. ^ Friedman 1994, p. 206. ^ Friedman 1994, pp. 206–207. ^ Gardiner & Chumbley 1995, p. 554. ^ Gardiner & Chumbley 1995, p. 613. ^ "Nuclear-powered ballistic missile submarines – Project 941". Retrieved 26 July 2015. ^ "Verifying". Retrieved 26 July 2015. ^ "Indian indigenous nuclear sub to be unveiled on 26 July: report". domain-b.com. 16 July 2009. Retrieved 24 January 2011. ^ "India nuclear sub project near completion". Reuters. 12 February 2009. Retrieved 24 January 2011. ^ "PM to launch indigenous nuke submarine by month-end". MSN. 16 July 2009. Retrieved 19 July 2009. ^ "Indigenous nuclear submarine goes on trial". The Hindu. Chennai, India. 19 July 2009. Retrieved 19 July 2009. ^ Sud, Hari (14 August 2009). "India's nuclear submarine and the Indian Ocean". upiasia.com. Retrieved 24 January 2011. ^ "India's nuclear submarine dream, still miles to go". Reuters. 31 July 2009. Retrieved 24 January 2011. ^ "Final test of K-15 ballistic missile on Tuesday". 25 February 2008. Retrieved 24 January 2012. ^ Friedman 1994, p. 194. ^ Friedman 1994, pp. 195–196. ^ "SECNAVINST 5030.8" (PDF). United States Navy. 21 November 2006. Archived from the original (PDF) on 22 July 2014. Retrieved 10 September 2008. ^ "NATO glossary of abbreviations used in NATO documents and publications (AAP-11)" (PDF). NATO. Retrieved 1 February 2014. ^ "Submarine Service – Royal Navy". Retrieved 26 July 2015. ^ "SNLE-NG Le Triomphant". netmarine.net. Archived from the original on May 21, 2014. Retrieved 19 October 2014. ^ "Russian SSBN Fleet: Modernizing But Not Sailing Much". Federation of American Scientists. 3 May 2013. Archived from the original on December 17, 2013. Retrieved 19 October 2014. ^ Diplomat, Saurav Jha, The. "India's Undersea Deterrent". The Diplomat. Retrieved 2016-05-13. ^ "Commissioning of INS Kalvari delayed | The Asian Age". The Asian Age. Retrieved 2016-10-16. ^ "Does China have an effective sea-based nuclear deterrent?". ChinaPowerCSIS. 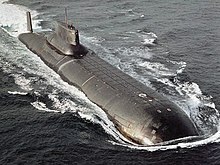 ^ "Russia to start building 2 nuclear Borei super-subs in 2013". RT.com. 12 January 2013. Retrieved 19 October 2014. ^ "Finally flying colors: Yury Dolgoruky nuclear sub joins Russian Navy". RT.com. 10 January 2013. Retrieved 19 October 2014. ^ "Construction in full-swing on India's 2nd and 3rd Nuclear Submarine — Defence Update | Defence Update". Defence News, Defence Update, India Defence News, Indian Defence News, Indian Defence, Indian Armed Forces, Indian Army, Indian Navy, Indian Air Force. 2015-12-17. Retrieved 2016-05-13. ^ Subranamiam, T.S. (26 July 2009). "Nuclear submarine all set to enter waters". The Hindu. Retrieved 19 October 2014. ^ "India set to launch home-built nuclear submarine". Vancouver Sun. 2012-08-10. Retrieved 2012-08-21. ^ "A peek into Indias top secret and costliest defence project, nuclear submarines". Retrieved 2017-12-15. ^ "From India Today magazine: A peek into India's top secret and costliest defence project, nuclear submarines". India Today. Retrieved 2018-11-03. ^ "New Successor Submarines Named" (Press release). Gov.uk. 21 October 2016. Retrieved 21 October 2016. ^ "New nuclear submarine given famous naval name". BBC News. Retrieved 21 October 2016. ^ "Q&A: Trident replacement". BBC News. 11 November 2006. Archived from the original on 7 December 2006. Retrieved 2006-12-01. ^ "The Future of the United Kingdom's Nuclear Deterrent" (PDF). Ministry of Defence. 4 December 2006. Archived (PDF) from the original on 6 December 2006. Retrieved 2006-12-05. ^ Weinberger, Sharon Weinberger Sharon (11 May 2010). "Five Big-Ticket Pentagon Programs in the Cross Hairs". Aol news. AOL Inc. Archived from the original on 14 May 2010. Retrieved 11 May 2010. ^ Chavanne, Bettina. "Gates Says U.S. Navy Plans Are Unaffordable". The McGraw-Hill Companies, Inc. Retrieved 12 May 2010. ^ Unnithan, Sandeep (23 July 2009). "Deep impact". indiatoday. Retrieved 19 October 2014. ^ "British and French nuclear submarines crash". The Sun. London. 16 February 2009. Retrieved 2009-02-16. ^ Allen, Peter; Kelly, Tom (17 February 2009). "British and French submarines packed with nuclear missiles collide beneath the Atlantic". London: The Daily Mail. Retrieved 2009-02-16. ^ Williams, Rachel (16 February 2009). "Nuclear submarines collide in Atlantic". London: The Guardian. Retrieved 2009-02-16. ^ "Nuclear subs collide in Atlantic". BBC News. 16 February 2009. Retrieved 4 May 2010. Gardiner, Robert; Chumbley, Stephen (1995). Conway's All the World's Fighting Ships 1947-1995. London: Conway Maritime Press. ISBN 1-55750-132-7. Miller, David; Jordan, John: Moderne Unterseeboote. Stocker Schmid AG, Zürich 1987, 1999 (2. Auflage). ISBN 3-7276-7088-6. Polmar, Norman; Noot, Jurrien: Submarines of the Russian and Soviet Navies, 1718-1990. Naval Institute Press, Annapolis, 1991. ISBN 0-87021-570-1. Polmar, Norman; Moore, K. J. (2004). Cold War Submarines: The Design and Construction of U.S. and Soviet Submarines, 1945–2001. Dulles, Virginia: Potomac Books. ISBN 978-1-57488-594-1. Polmar, Norman (1981). The American Submarine. Annapolis: Nautical and Aviation Publishing. pp. 123–136. ISBN 0-933852-14-2. Wikimedia Commons has media related to Ballistic missile submarines. Video showing various SSBNs in action. This page was last edited on 20 April 2019, at 16:14 (UTC).